Mogilyov (also spelled Mahilyow) is a city in eastern Belarus. It is about 76 km from the border with Russia's Smolensk Oblast and 105 km from the border with Russia's Bryansk Oblast. As of 2011, its population was 360,918. It is the administrative centre of Mahilyow Voblast. 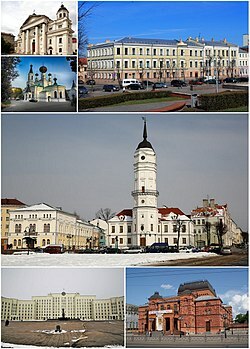 It is the third largest city in Belarus. This page was last changed on 31 August 2017, at 08:09.